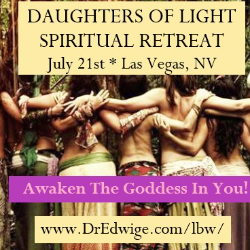 A new day is dawning and the Daughters of Light are being beckoned to come together once more. The Higher-Self, is a glorious, great intelligent, powerful being of unlimited perfection, splendor and limitless potential. This is who you truly are. Your third-dimensional life on earth reflects only a very small portion of this truth. It is time to move out of seperation and duality consciousness into wholeness. You do not need to leave the body to experience Oneness, just leave the fear. This retreat has been designed to: aid in the integration of the new energies of this time and space, including the Photonic Light. It's time to become a master of yourself and your molecules, to renew, rejuvenate and awaken you to your eternal presence. 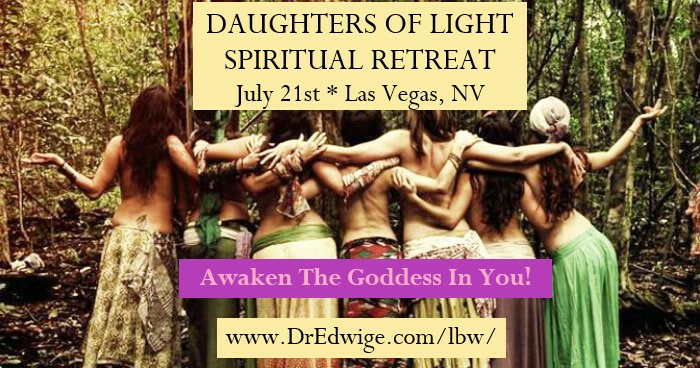 Join in this beautiful as you Awaken the Goddess in You! My name is Dr. Edwige and I AM the living embodiment of the Cosmic Mother. I usher in change as a surrogate of divine feminity. By demonstrating what is achievable by all of us. I walk the highest path, constantlly accessing the codes and keys for humanity. My entire life, this incarnation, has been totally about the embracing of my Highest Sovereign Self. The spiritual journey that makes up my total being brings me here to this place of gratitude and selfless service. I am here to assist souls who are ready to awaken and ascend. I AM a master level Light Code Activator. I am able to adjust your cosmic DNA at the cellular level. The qualities embodied with these activations are among those that are needed to live in the Golden Age. They are of Feminine Nature and exist to balance the strength and power of the masculine force that has dominated on earth for the past 26,000 years. NOW is the time to return to a balance by embracing the Divine Feminine energy of the Cosmic Mother. Through this cycle, humanity will come to know itself as a Soul of God, sourced from within the core of the Galactic beam of the Milky Way.